Soy Taco Sweet Potatoes is a delicious and easy vegetarian meal perfect for Meatless Monday. Taco spiced veggie meat crumbles, sautéed peppers, and beans stuffed into a baked sweet potato with all the fixings! Weight Watchers friendly recipe for only 8 SmartPoints per serving. You might not know this, but a few years back I was vegetarian. During my vegetarian years, I learned a whole new way of cooking and eating. I became a huge fan of roasted vegetables, tofu, and soy veggie meat. While I am no longer a full time vegetarian, I still crave all veggie meals and take breaks from meat. 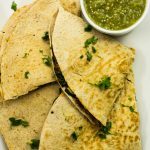 My Soy Taco Sweet Potatoes is a delicious and easy vegetarian meal. Taco spiced veggie meat crumbles, sautéed peppers, and beans stuffed into a baked sweet potato with all the fixings! This is a Weight Watchers friendly recipe and each serving is 8 SmartPoints. I have a new obsession… soy veggie meat. I’ve tried so many different brands of veggie meat and finally found “the one”! 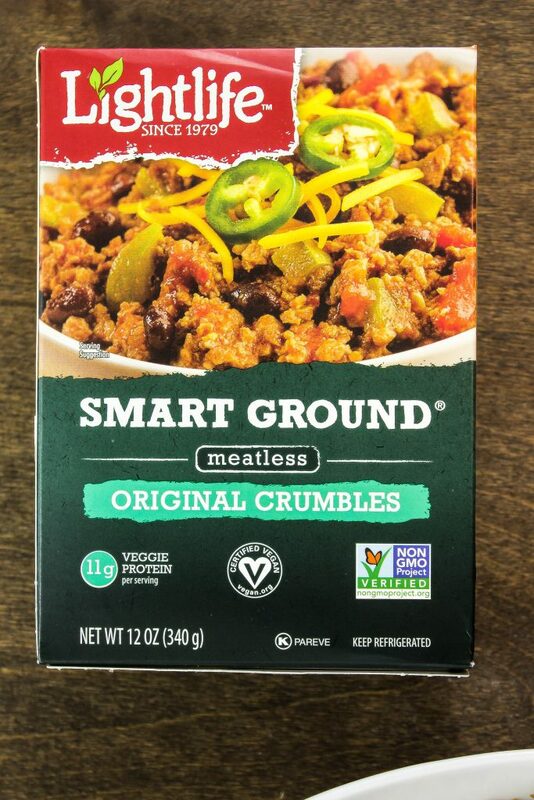 LightLife Smart Ground Original Crumbles are by far my favorite veggie meat crumble brand. What I love about this brand is the meat is not frozen, so you don’t have to worry about defrosting the meat or worry about soggy meat. That’s the issue I’ve had with other brands of veggie meat that are frozen… the meat ends up kind of soggy after cooking it. 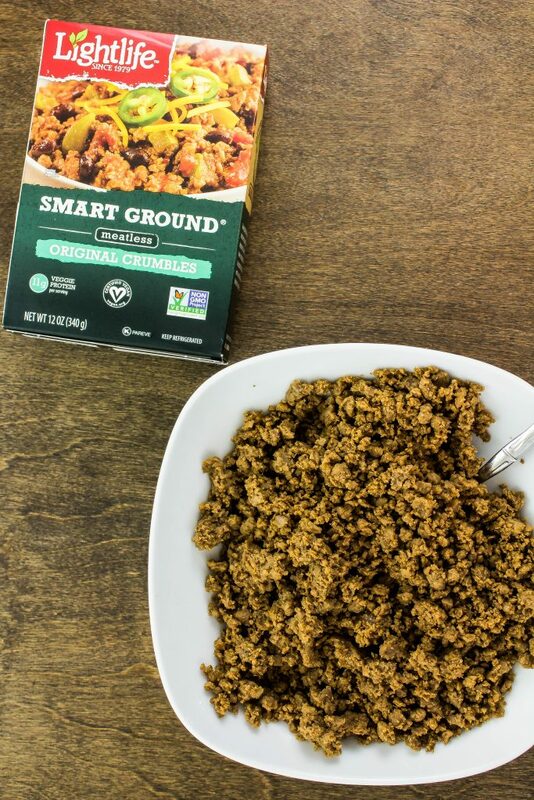 LightLife has a ton of delicious vegetarian varieties of meat and so far my favorite is the Ground Original Crumbles. I like to make these crumbles for veggie tacos, tostadas, and my Soy Taco Sweet Potatoes. You can find this brand of soy veggie crumbles in the refrigerator section of your grocery store (where tofu is located). 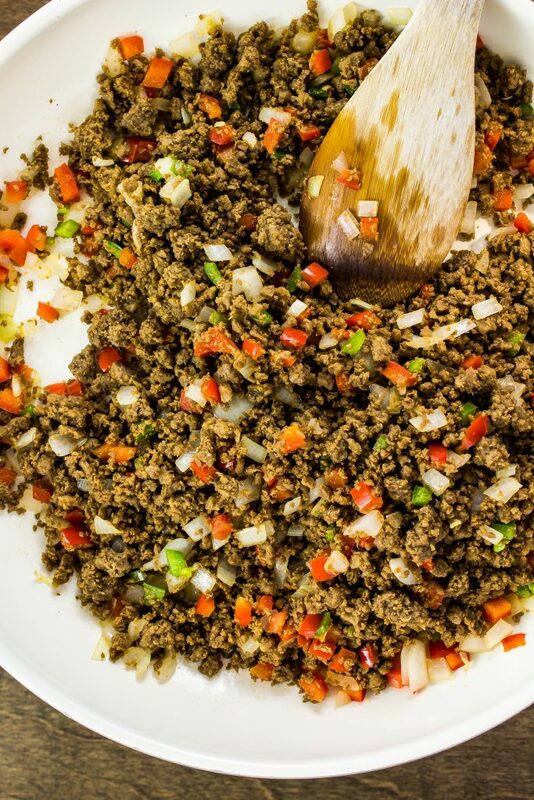 These veggie crumbles look just like ground beef and have the same texture as ground beef. You might be wondering why I would use ground veggie meat instead of ground meat… well, sometimes I just need a break from meat. For the past several months, I’ve been having Meatless Monday meals. On the weekends, I usually indulge a bit so by Monday I need a break from all those guilty pleasures and meat. These potatoes are PERFECT for Meatless Monday! 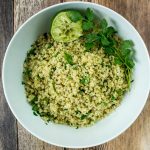 This recipe is super easy to follow! You could make this on Sunday for a quick dinner throughout the week or for weekday lunches. To start, bake the potatoes first (this step can totally be done ahead of time). Clean sweet potatoes and pierce the outside with a fork about 5 times. 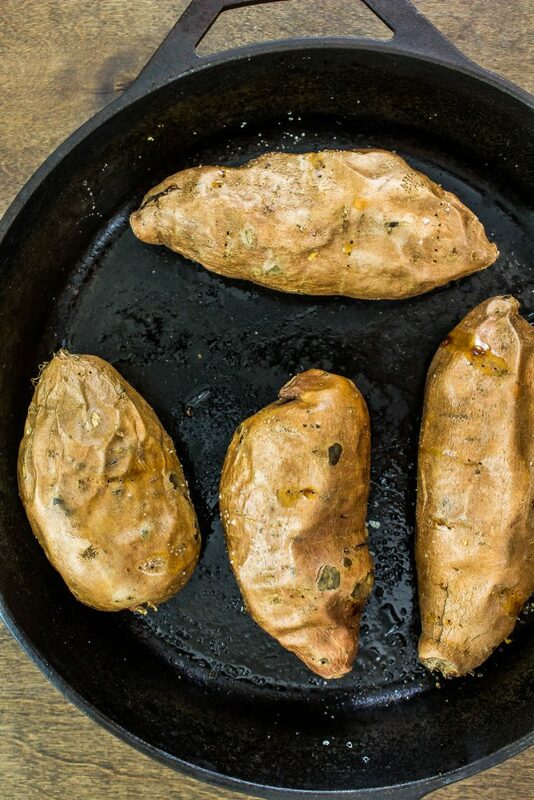 Loosely wrap the potatoes in foil, place on a baking sheet, and bake 5 sweet potatoes in the oven at 400 degrees for 1 hour. The veggie meat is just as easy! Heat a large skillet over medium heat and add olive oil. Sauté diced bell pepper, onion, and jalapeno for about 7 minutes or so until tender. Add the soy veggie crumbles, breaking up the meat, and mix. Season the mixture with salt, pepper, garlic powder, chili powder, chipotle chili powder, and cumin. Add water, mix well, and let cook for about 15 minutes or so. Add pinto beans and cook for another 5 minutes. Easy right?! 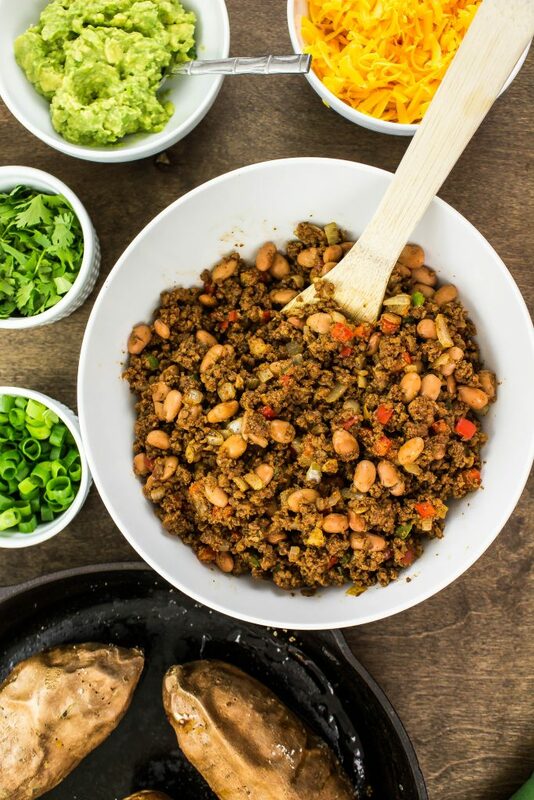 This veggie meat mixture is delicious and perfect stuffed into a sweet potato, mixed with eggs, or wrapped in a tortilla for veggie tacos! 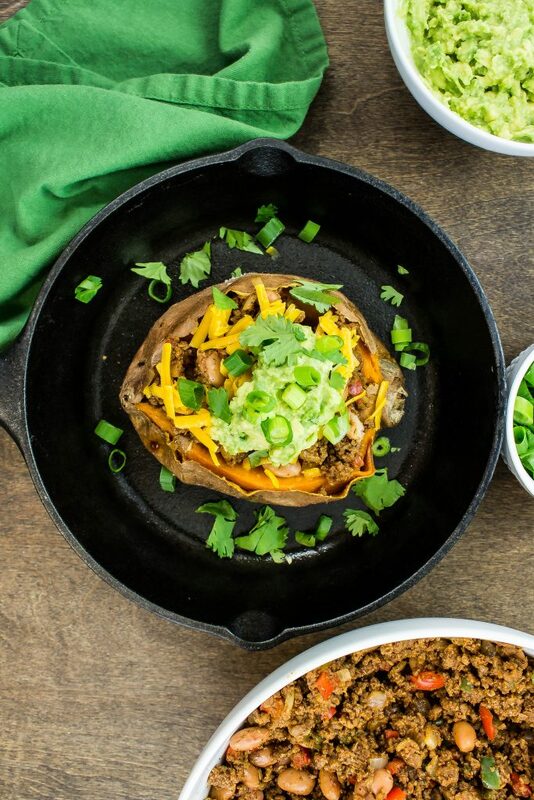 To assemble these Soy Taco Stuffed Potatoes, gently cut into the center of the baked sweet potato and open the potato. Add about ½ cup veggie meat mixture to the top and garnish with cheese, Greek yogurt, cilantro, and green onion. Clean sweet potatoes and pierce the outside with a fork about 5 times. Loosely wrap potatoes in foil and place on a baking sheet. Bake for 45 minutes to 1 hour, until tender. Dice bell pepper, onion, and jalapeno and set aside. Heat large skillet over medium heat and add olive oil. Add diced bell pepper, onion, and jalapeno. Sauté for 7 minutes, until onion is translucent. Add veggie meat and break up. Season with salt, pepper, garlic powder, chili powder, chipotle chili powder, and cumin. Cook for 15 minutes, stirring occasionally. Add pinto beans and corn and stir until combined. Cook for another 5 minutes. Gently cut into the center of the baked sweet potato and open the potato. Add ½ cup veggie meat mixture into the middle of the potato. Top with cheese, Greek yogurt, cilantro and green onions. Nutrition is based on the NEW Weight Watchers Freestyle Program guidelines. Nutrition calculated using Weight Watchers calculator. January 21, 2018 at 2:21 pm I hope you try this meatless meal Lydia!! January 21, 2018 at 2:21 pm Delicious and healthy! 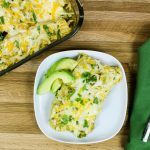 January 11, 2018 at 7:04 pm These look SO GOOD! 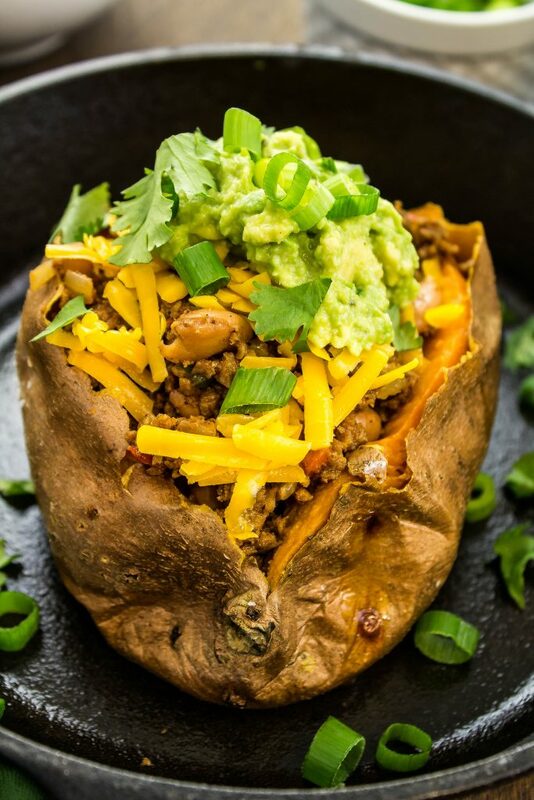 I LOVE a good loaded potato and love that you put a twist on it by making it taco flavor! January 21, 2018 at 2:21 pm Loaded potatoes are my favorite! January 12, 2018 at 12:26 pm This looks so good! I think I'd look for an alternative that doesn't contain soy--it's something I try not to consume--but I would definitely go for this!!! January 21, 2018 at 2:19 pm You could totally use any non soy veggie meat or even meat if you'd like!